As a trendy city in Europe, Berlin has been under the eyes of tourists, as well as foreign investors and, thereby, has felt the damaging effects of gentrification and touristification.As participants of Urban Spaces, a project of SCI Germany, we went out to the streets of Berlin to investigate how these phenomena threaten local communities, local businesses & the local way of living and how Berliners have been organising themselves in a resistance movement. Initially, our idea was to showcase alternative ways of nightlife in Berlin, where people can go and spend their time in an affordable place. 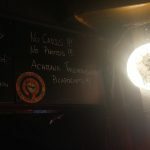 After researching, we found some interesting concepts of alternative nightlife here, such as KüfA “Küche für Alles” (Kitchen for All) and open places which promote culture, art, sustainability, social inclusion, and tolerance. As soon as we started contacting those places, we realised that most of them are organised in collectives which have been fighting against the gentrification of Berlin for many years.Therefore, most of the people managing those places were very protective and didn’t want to give any interviews or have the place filmed or photographed without bringing our proposal to a discussion in the collective first. When we entered those places, we noticed that signs saying “No photo. No Video.” were hanging all over there. By talking to employees, we found out that avoiding the tourists’ attention was a way of protecting themselves against gentrification. Most of these places have been owned by collectives for more than twenty years since, at the time, it was still affordable for regular people to buy property in Berlin. Currently, however, it is almost impossible for a lower-middle-class businessperson to invest her/his money to open a local business in Berlin, due to soaring rent prices as a result of gentrification and real estate speculations. 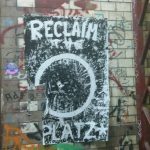 At the last place we visited, we luckily found a friend, who introduced us to Dragoner area, a 47.000 square meter site awaiting renovations in the heart of Kreuzberg. As soon as we arrived there, we got to know Ulrich, an activist who has been involved in the fight against privatization & gentrification in the last years. He explained that Dragonerwas a place that was used by the British during the occupation of Berlin after the IIWW. Many buildings in this area are more than 100 years old and therefore protected as a patrimony to be preserved. Nevertheless, there were already some investors interested in buying this place for profitable proposes, which would contribute even more to the gentrification in Kreuzberg. 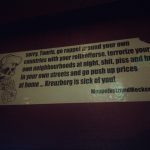 To prevent this there are initiatives and activists like Ulrich fighting for the interest of the local community. Their activism has already made a positive impact, as the city has granted a building including 550 square meters to be used as a “Kiezraum”, an open community space for cultural, artistic, social and recreational purposes. That is to say that although the beasts of gentrification and touristification have been attacking many European capitals, like Berlin, Paris, Barcelona and more recently Lisbon and Athens, there are a lot of alternative ways we can engage in the fight to defend our rights to the city. As our final words, we ask you, the reader, if you are suffering from the consequences of gentrification, join an initiative in your city that is active in the resistance movement. Become an active citizenship! You are not suffering from gentrification alone and therefore you shall not fight it alone!